WOW! Just wow! This book completely took me by surprise! I was impressed by the movie version of The Neverending Story as a child but it didn't move me enough to warrant repeated viewings or motivate me to seek out the source material. For nostalgia I recently re-watched the movie and was disappointed by how poorly it had aged. This time, however, it DID inspire me to give the book a read and I'm so glad that I did! It turns out that the movie really comprises only the first act of the much longer book. This book is, literally, fantastic. It is a sweeping epic journey with enchanted worlds, magical characters, and mythical creatures. Most characters are fleeting yet the book is written such that you still care about them even without pages and pages of development. Somehow The Neverdending Story manages to use these brief encounters to build a much richer universe, leaving the reader's imagination to fill in the details with, "But that is another story and shall be told another time." The epic story is underpinned by themes of self efficacy, self image, and destiny. In many ways it reminds me of a much longer, more detailed version of Coelho's The Alchemist. It goes a step further, though, and adds "meta" themes of human fantasy and escapism. This meta commentary doesn't QUITE hit its mark for me - I think its reach exceeds its grasp a little - but it doesn't in any way detract from the rest of the story. The most impressive aspect of The Neverending Story for me is that it is translated to English from its original German. It features so many charming character descriptions, clever turns of phrase, and even rhyming verses of poetry/song that its translation must have been an incredible labor of love. The end result is, well, fantastic, but I admit that it has me yearning to learn (I feel the yearn - the yearn to learn!) German just to be able to read the original source material. Bryan's great adventures learning German . . . but that is another story and shall be told another time! Ridley's first and most consistent argument is that specialization (the ability of one person or organization to do one thing while another does another thing) and exchange (the ability to trade the products of those two things) set humans apart from other animals and enable growth / prosperity because the whole us greater than the sum of the parts. He provides a great deal of evidence for this position and his argument is quite compelling. His second argument is that time and again humans have found ways to overcome dire threats to their well-being, hence the cause for the optimism in the title. He also argues that government regulation by and large interferes with economic growth (through specialization and exchange) and inhibits human innovation (which we need to overcome all of those dire threats). These arguments are cogent and, if the book had stopped here, I would have given it a higher rating. Ridley goes a step further, though, and effectively argues that, because humans have a long tradition of overcoming threats, we shouldn't concern ourselves with said threats. I take umbrage with this kind of fatalism and counter-argue that concerning ourselves with said threats is exactly HOW we keep overcoming them - but them I'm an entrepreneur while he is a [minor] British noble heir so he and I may have very different ideas about self efficacy and agency. The author also contradicts himself frequently when convenient for his arguments. For example, in one section, he demonstrates how foolhardy it would have been to extrapolate trends from pre-industrial-revolution economies into the 20th century. The industrial revolution changed the rules of the game dramatically such that some things that had previously been linear became exponential. Yet, when arguing against the seriousness of some current threats - like climate change - he extrapolates trends from long ago to support his point. Not only is this fallacious and hypocritical, it seems willfully ignorant in his particular case: Ridley was Chairman of the first English bank to go insolvent in 150 years at the outset of the 2007 financial crisis. If anyone should understand the folly of making decisions on anachronistic data, it should be he! As another example, he cites multiple reasons (high cost, inconsistency of production, etc.) why green energy technologies are inferior to fossil fuels (Ridley has been accused of a conflict of interest in Parliament due to his investments in the coal industry.). However, he spends chapters describing how humans invariably overcome exactly those types of challenges. Indeed it is instructive to read this 2010 book through the hindsight of 2017 as we have seen innovations drive down the costs of green energy technologies substantially. He should listen to his own advice and be optimistic! Ridley's worst offense in this book is a liberal use of the straw man fallacy. He portrays all environmentalists, for example, as being anti-growth and anti-technology. He also frequently uses impractical biofuels as a green energy punching bag as if they are the only alternative to fossil fuels. His data are quite selective and he introduces false dichotomies, e.g. between combating climate change and combating malaria. This book started out well and then really fell apart for me. It's almost as if Ridley had a good concept for the first few chapters but then was compelled by his publisher to stretch it into a longer book. In doing so, he introduced many logical fallacies and made proclamations that haven't held up even just a few years after publication. That said, it was an interesting read - especially the beginning - but the content might be better suited for a TED talk than a 450-page book. As a follow up to yesterday's post about the Final [Fab] Four and in celebration of the UNC Tarheels basketball championship last night, here are some more thoughts on the Beatles that came from discussions in the group. First thought: even if you go back pre-Beatlemania to their time as a cover band, their potential for greatness is already evident. Live at the BBC and several other compilation albums feature their early material - mostly covers with very little rearrangement of the source material but it's really good. Even before they developed their signature sound (and then treated us to the evolution of said sound over seven years), they were just damn fine musicians. They made simple 50s/60s rock and roll staples sound so good! It ought to be criminal that four lads from Liverpool could do such excellent renditions of American rock and roll spanning a significant range - from Motown to Memphis Soul, from high/smooth Smokey to abrasive Little Richard, from guitar-driven Chuck Berry to vocal harmony-driven Everly Brothers. Their covers are fathful-ish to the source material but with little flourishes that put their own decided stamp on it. There's just a certain je ne sais quoi they add that takes - with rare exception - each song to 11. Trying to draw comparisons yields many results that hit some of those achievements but not all. Has anyone else in contemporary popular music matched or exceeded them? The Rolling Stones, for example, have probably hit a similar number of good songs - but over a much greater period of time. You could make an argument that Jimi Hendrix was heading along a similar trajectory with three amazeballs studio albums between '67 and '68. Unfortunately he was effectively a one-man show without the other band members to challenge and collaborate with him so his ceiling may have ultimately been lower and/or he simply may not have been able to keep up the pace. I like to think that he would have continued to innovate, possibly by teaming up with others in the early 70s. Either way, we'll never know. What about in other eras of music? Mozart? What about other arts? Picasso? Several of the Renaissance masters might fit the bill - especially da Vinci given his impact on the arts and the sciences. Like the Beatles, some of them had a group dynamic force multiplier effect. They weren't in a group together per se, but they worked in close proximity to one another, saw the works of their peers, and adapted/competed with their subsequent oevres. What about literature? Isaac Asimov has probably been as prolific and influential in his craft - but over the span of 40 years rather than 7. Perhaps, given the size/scale/timeline of writing a novel vs a song, that's an appropriate time scale for comparison, though? "It can also be argued that the vast majority of his influence on Science Fiction, in particular, in the first 10 years of his output - maybe '42-'52 - were the most prolific and groundbreaking. And I think, really, a novel is pretty directly comparable to an album, whereas a short story is like a song. In that case, Asimov BEATS the Beatles in terms - not only in output and inventiveness - but in Longevity of concentrated output. And he'd probably still have been going through the 2000's if he hadn't gotten an AIDS-infected blood transfusion." What about other areas of work? Are there prolific academics, for example, who have matched this level of productivity relative to the norms for their fields? Multiple members offered up Russel Reiter, who has authored or co-authored 1364 peer-reviewed scientific publications over the past 45 years or so - more publications than most have even read. The Apollo space program was held up as an example in discussion. Clearly there were thousands of people working on it, not just four, but what they accomplished, not only in the end goal but also in all the intermediate innovations that were necessary to achieve that goal, is something we hadn't seen before and haven't seen since. Interesting that it took place during the same exact time period as the Beatles! We also discussed examples from the world of sports. Athletes are a tough comparison to make since they're limited by seasonality but I think there are definitely analogies to be made. Michael Jordan? Wayne Gretzky? Federer/Nadal? One member offered up Esther Vergeer, who was #1 in her sport (wheelchair tennis) for 14 years and retired on a 470-match winning streak! Some of these analogies may be more apt than others but one thing is clear: the Beatles were very special. I don't know if we'll see their likeness again in my lifetime or if the time and place that brought them together was unique. Either way, we're all the better for them having been together, however briefly. drew up a bracket of 128 Beatles songs and we spent the month of March in a Facebook group devoted to the discussion of which songs were the best. More than 100 people participated, ranging from those who were alive during Beatlemania to those, like me, who were born long after the Beatles had broken up. Everyone brought a different perspective and often there were fiercely passionate discussions of particular songs or matchups. Songs were seeded according to the organizer's personal preferences and paired in an opening round of 64 one-on-one matchups. Over two days we voted for our preferred song in each matchup with winners advancing to the next round (32 matchups). Winners of the second round voting advanced to the next round and so on until, in the end, there could be only one. Some of the matchups were easy. While My Guitar Gently Weeps against Got To Get You Into My Life, for example, had an obvious (to me) victor. On the other hand, though, many matchups were agonizingly difficult, pitting two beloved songs of very different styles against each other. 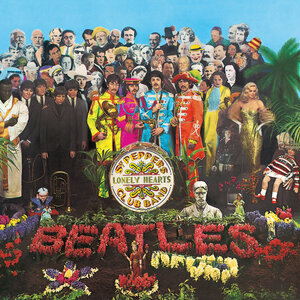 Sgt Pepper's Lonely Hearts Club Band against Across the Universe, for example - how do you even compare the two? It's like choosing which of your children you love the most - impossible! The only way I could choose a winner in such matchups was to go with my heart. Many others opted to rationalize their decisions with lengthy arguments about the importance, critical reception, innovation, and influence of different songs. While I found such efforts to be misguided, the resulting discussions were packed with information - both historical and musical - much of which was new to me. Rather than this bracket simply being a fun diversion, it turned into a learning experience as well. After each round the organizer would post a recap in the style of a sports analyst. Clever as he is, he would sprinkle Beatles puns throughout. This wordplay was welcome salve for my wounds whenever my songs would lose and fail to advance to the next round. The link above to the bracket includes the results of voting in each round. What would have won the Final Fab Four tournament in your bracket? What do you think won in my bracket?